Universal Avionics’ flat panel EFI-890H display designed for helicopters. Universal Avionics of Tucson, Ariz., has uncovered the EFI-890H, a helicopter flat panel display based on the company’s EFI-890R. The display will include a collective cue and X-video night vision imaging system (NVIS). 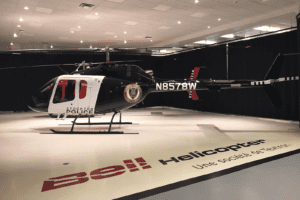 Universal is seeking approval for a number of helicopter types, including the Bell 212/412 and Eurocopter EC155/AS332, and the Sikorsky S-76 and S-61.